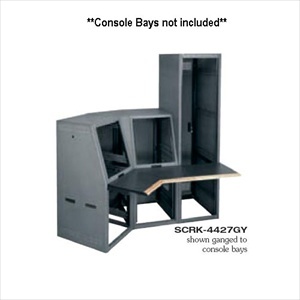 Middle Atlantic SCRK / SCQRK series enclosures are ideal for applications that need ganging of cabinets for the surveillance or monitoring equipment. These enclosure equipment racks were designed thinking of the needs of security, control rooms, command or data centers, and can be used in conjunction with base modules, top tiers, corner wedges and writing surface options giving you unlimited flexibility. Surveillance consoles are able to hold up to 2 tons, making them ideal for those jobs that require a lot of equipment. These equipment enclosures are available with or without the pullout sliding rack tray to prevent back injuries, and come with pre-installed leveling feet. Both models come with a grounding bar at the bottom of the enclosure to protect your electronic devices. 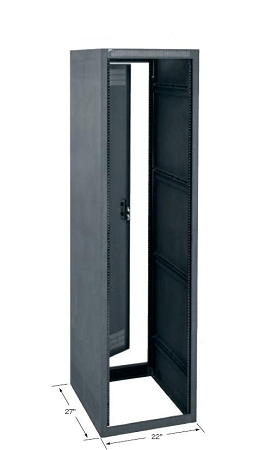 Enclosure racks are fully adjustable front and rear, 11-gauge, 10-32 threaded numbered rails for easy leveling of your networking units; have rear doors that lock for added security, and are available with knockouts in sizes varying from 1/2" through 1-1/2” for the different wire diameters of networking, audio/video or fiber optic cables. The fully welded 16-gauge steel SCRK and SCQRK enclosures come in three different finishes: Black, granite Gray or Light Gray. NOTE: Models with slide out rotating rack bay include factory-installed foot-rests. Certifications: Seismic certified (UBC 1997 & CBC 1998 Zone 4; IBC 2000, IBC 2003, ASCE 7 - 02, NFPA 5000 Seismic Use Group III) for protecting 375 lbs. of essential equipment when used in conjunction with Middle Atlantic’s SC-Z4 brackets.